Well I give them paper pouches stuffed with treats as well. They prefer to chew through them rather than the letter pouches that way. i'm a little concerned though. i am wearing a top hat and purple dress, carrying a wicker suitcase and a large polar bear (he's still not well otherwise i'd make him walk) and will have a vacant stare due to exhaustion from packing. i would not like to pass anyone in white coats today. My dear, if anyone should accost you, white coated or otherwise, inform them in haughty tones that some people consider you mildly eccentric. Then tell them to carry your bags so that you don't have to complain of their impertinence to their masters. The last person I trusted with one of my bags ran off with it. I had to call Alan Quatermain in to track the blaggard down and retrieve it. Happy friendship day!! I spent this friendship day making the pinata of hate for tomorrow's "Happy Nemesis Day" He loves acid showers! tomorrow is happy nemesis day ? TSM will be pleased. I think you have both muddled with Porcupine Pie and Chicken Ripple Ice cream. Mmmmm.... chicken ripple.... have you tried the steak chip flavour yet? I wish you hadn't suggested that, I've been fool enough to try it. The result is... not pleasant. No, not pleasant at all. What? So you didn't try chocolate cheese? Chocolate cheese is sooo 20th century, old chap! Last night I saw the future... chocolate cake with chocolate fudge and pieces of chocolate in it. Nothing beats chocolate with chocolate amalgamated with more chocolate. i gave the stuff up some 7 or more years ago, i used to gorge myself on copious amounts of the stuff, baking cookies, making decadent cocos with meringue on top, chocolate bars, chocolate chips, chocolate clusters, chocolate hips. i had to quit do you understand me, i couldn't take it anymore, and now.... it hunts me, it haunts me like some madman in the night.... or some lost love come to murder me... oh the torture of a bakery, the utter agony of a coffee shop, the inhumanity of a holliday gift tray! smeared cheek to blinding cheek with your brown dare i say.... chocolaty goodness, enthralled in madness, innervating my tastebuds, consummating my desires, extraditing every last morsel from the bottom of the bowl with my finger tips, smacking my lips in utter ecstasy... oh chocolate... can it be? That is wonderful- it reads in the same vein as Baudelaire waxing lyrical about Absinthe. hm, well i went and read some Baudelaire very quickly, and having not been exposed to him prior, i must assume that he, as i am, is a genius! Do you have any tips on skinning animals, please? Do you need a special knife or anything like that? Should you do it before or after rigor mortis sets in? Your fingers will be too stiff for the fine movements required after. 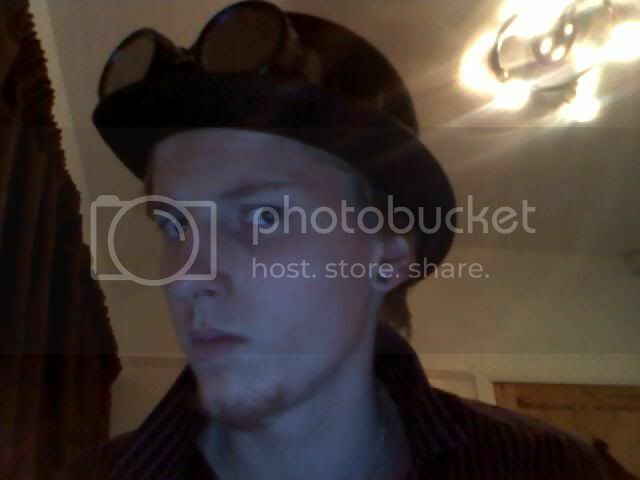 Isn't steampunk and eccentric somewhat redundant? That having been said... I'm in! Hey! *goes loking for a book she ot for christmas and munches choclate covered grass hoppers* I ate ants regularly as a kid, and i just had an arguement with lillith. *grimble about sewing machines with a mind of their own. She say she wont work for me if i dont start getting ready for anime boston soon.